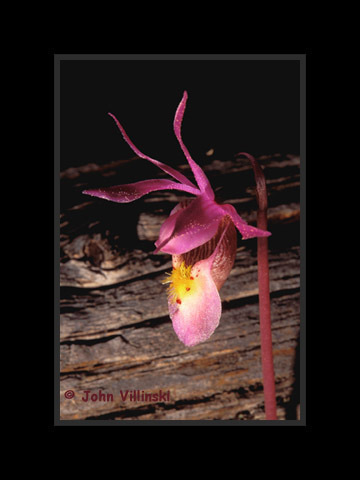 The Calypso bulbosa is the one orchid in Arizona that is the classic "Lady Slipper" shape. like most orchids, this species is fairly rare. My friend Pat Hartshorne found the first of the dozen or so we found during our camping trip over Labor Day weekend in 2001 in the White Mountains near Greer, Arizona. I enjoyed the background of the log behind this flower.